Beautification - Focal points during the day now stand out and become more visible. Textures not seend in daylight now have eye-catching detail. Architectural features of the home can be accented which brings the home and landscape together to create a resort-like feel. Usability - Landscape lighting enjoyably extends the time spent outdoors. Now patios, pools, and children's play areas become entertainment venues, or just relaxing places to unwind. Safe Passage - Hazards such as steps, low-hanging or thorny vegetation, abrubt elevation changes or toys in a walkway can be avoided with properly placed landscape lighting. Security - It is a proven fact that a well-lit landscape will deter potential intruders by eliminating dark areas and shadows that would conceal movement around the property. 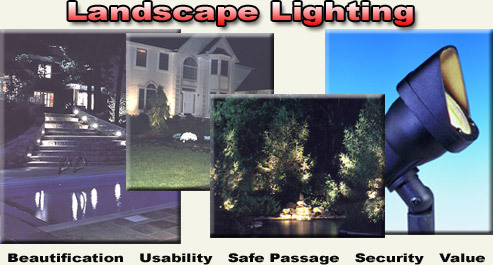 Landscape lighting also allows the homeowner and neighbors to see and identify potential intruders. Value - From a personally pleasing perspective, landscape lighting not only brings the property to life, it brings life to the property. From a practical perspective, professionally installed landscape lighting provies an excellent return on investment, because it creates a marvelous first impression when viewed by family and friends or possible perspective buyers.